The designation of churches as Presbyterian indicates their governance by presbyters-both teaching elders (ministers) and ruling elders who are chosen by the congregation. On the local level, these elders are known as a church’s session. Presbyterian ministers and elders serve together in a system of representative assemblies at the congregational, regional (presbytery), and national (general assembly) levels. The majority of decisions made concerning a church are made by the church itself. The presbytery and general assembly serve as checks against doctrinal error, but they do not strictly control the local congregations. For more information about our Presbytery, visit www.pbyofnewcovenant.org. 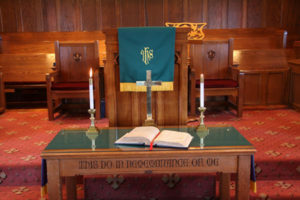 Learn more about Presbyterian Church (U.S.A.) online at www.pcusa.org .